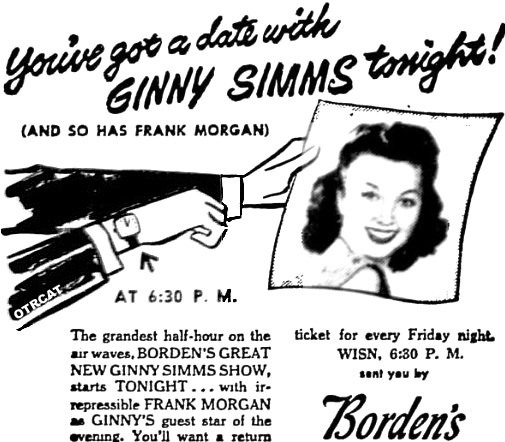 "Ginny Simms on Guest Star Radio"
Ginny Simms was born in San Antonio, Texas, 1915 but was raised in California. At age 20, Simms joined the Tommy Gerun band and then the Kay Kyser orchestra in 1938. 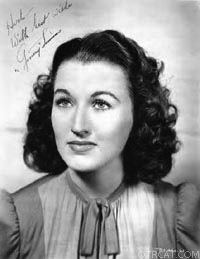 With her own radio series (sponsored by Philip Morris), Ginny became a popular figure during WWII, interviewing servicemen from all over the globe, who got to send messages to their families over the air. She went on to appear in such lightweight MGM film fare as Here We Go Again (1942, with Edgar Bergen, Charlie McCarthy and Fibber McGee & Molly), Hit the Ice (1943, with Broadway Rhythm (1944). Following Louis B. Mayer's divorce she often escorted him. Unfortunately MGM never promoted her as a bankable star, however, and her last film with them was in 1946. Simms was married three times, and passed away in 1994. Please note these recordings are also available in the larger chronological Divas of Old Time Radio Collection. I want to thank you for "OTR", my three brothers and myself spent many hours in our childhood huddled around the old radio, enjoying the entertainment in "the good old days". This collection is much appreciated -- brought back a lot of memories. Thank you for this. I love OTRCAT and all that you do.